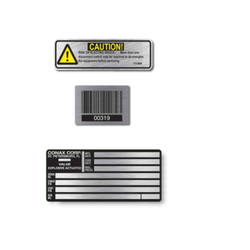 Prominent & Leading Manufacturer from Thane, we offer aluminum labels. We are offering various sorts of Aluminum Labels, strong adhesive machine labels, customized machine labels, colorful labels, etc. These are offered in various designs, shapes, sizes and colors. Further, these are packaged in quality materials and customized to suit clients’ concerns. We charge industry leading rates.